The NEW Jeep Wrangler Sierra Sport Hood decals stripe kit for the ALL-NEW 2018 & 2019 Jeep Wrangler Sport Hood Decal is the perfect upgrade for this rugged yet refined off-road SUV. Custom made to fit the hood of the New 2018 & 2019 Jeep Wrangler JL Sport and the 2018 Jeep Wrangler JL Unlimited hood vinyl graphic stripes kit is Cut To Fit so that you get an easy, straight out of the box, installation and NO trimming. We take quality very seriously here at RaysAutoTrim.com and that’s why we never use low quality sign quality vinyl in any of our vinyl decals and stripes kits. This Outfitter Jeep Wrangler hood vinyl graphics decal stripe kit is manufactured from top quality 3M high performance automotive grade vinyl and it comes with our 7-year limited warranty. 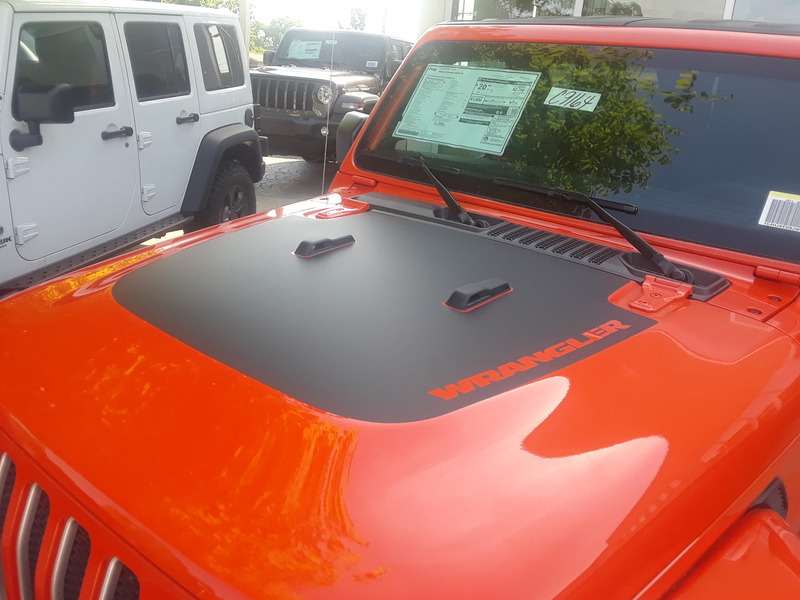 Jeep Wrangler Sport Hood for the 2018+ Jeep Wrangler JL and JL Unlimited does not get any better than this. These Jeep Wrangler Hood decals are the same high quality that would get from a Jeep dealership or a professional stripes installer. The only difference is the amazingly low RaysAutoTrim.com price! You won’t find high quality 2018-2019 Jeep Wrangler JL or Jeep Wrangler JL Unlimited hood vinyl decal graphic stripes at low prices like this anywhere else. RaysAutoTrim.com is the number one online supplier of factory quality vinyl stripes kits at low prices.